This picture shows a finished TI knife with a tapered octagon Curly Maple handle. The knife has a stell guard and top cap, don't use brass on an early knife, it almost always would have been iron or steel. This knife is constructed like the old ones, it has a tang that runs through the	handle	and	into the stell cap where it is peened over, I cheat and put epozy in the handle......the old boys used pine pitch, 18th centruy form of glue. This blade shape was copied from one that was found at Fort Ticonderoga in a grave I believe. Hence	the	name. The blade is made from file steel and has a hammered forged finish. The finish is left black but you can clean it up bright if you like. 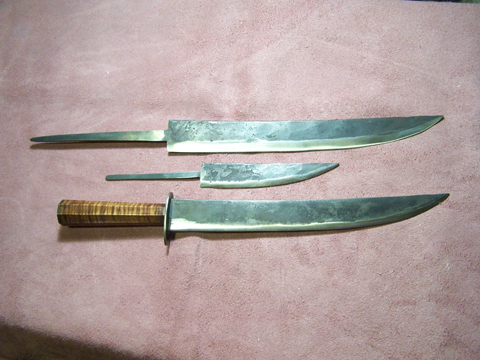 Blade Size is about 9 1/4" or so, and 1 1/4" wide at its widest, and about 3/16" thick at the guard. The tang is about 5" long. Comes with a leather hand done sheath, light brown color. Blade large size is $67.50 Postage Paid. The small blade is 5" long x 1" wide and 11/64" thick. Like above but smaller............Ticonderoga small bd.is $21.50 Postage Paid.